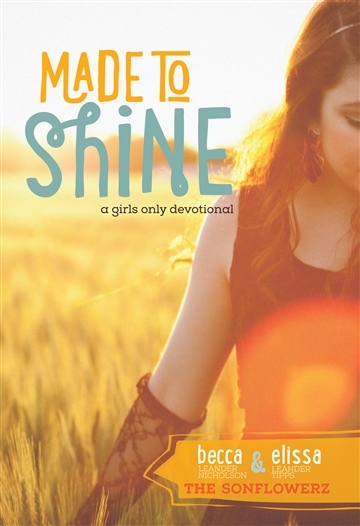 Indie sister duo The Sonflowerz, known for their worshipful and inspiring pop songs, announce the October 29 release of “Made To Shine,” a new 33-day devotional book created especially for girls ages 12-17. Funded by a recent Kickstarter campaign and following the release of their critically acclaimed EP Love Walked In, “Made To Shine” is the first book from singer/songwriter sisters Elissa and Becca Leander. Moved by conversations with their young fans, “Made To Shine” takes its name from one of their songs written for a teen girl who was the victim of bullying. And the book itself deals with topics that include relationships, peer pressure and self-image, all examined in light of the Christian faith. Tackling many of these themes, “Made To Shine” offers conversational, story-driven devotionals, each followed by a “Reflection & Action” with scripture references as well as a “Playlist for the Day,” with recommended songs from some of The Sonflowerz’ favorite artists. “We wanted to leave the girls with suggestions for songs that reinforce the message, pouring more positive content into their hearts and lives,” explains Becca. The book, which is available for sale at www.sonflowerz.com and coming soon as an e-book, is the latest step in a ministry that has taken the sisters across the U.S. and throughout the U.K. Based in Colorado Springs, Colo., the British/American sisters have been ministering together since their teen years when given the opportunity by their church to share a song they had written. Thirteen years later, Elissa and Becca remain committed to praising God and ministering to others. Their next project is a “Made To Shine” interactive tour for girls, which they plan to launch later this fall. Additional information, news updates, albums and the new book are all available at http://www.sonflowerz.com. To follow The Sonflowerz on Twitter, visit http://www.sonflowerz.com.